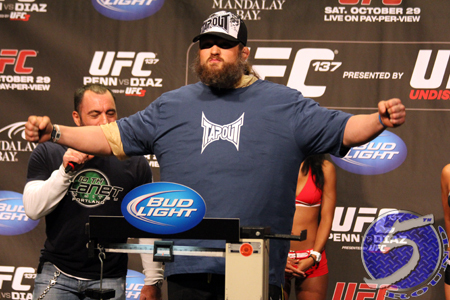 Roy Nelson’s (Pictured) self-promotional skills cannot be denied. In Nelson’s latest stunt, the UFC heavyweight will attempt to shed roughly 60 pounds in order to make the light heavyweight division IF his official Facebook page can reach 100,000 likes by March 17th. “Big Country” dropped the gantlet on himself Sunday afternoon. “What’s better twitter or Facebook to spend more time on?,” Nelson asked his fans. “The reason is my friend and I had a discussion about what was better? I think twitter just because of use and for fans interaction, but Facebook is 20x bigger. So we decided to bet. I said if it so easy and great I should be able add 100K fans in 2 weeks because I have that on twitter. Facebook is bigger and better so this should be easy. Right? Although Nelson is a former IFL heavyweight champ and captured “The Ultimate Fighter: Heavyweights” tournament, UFC president Dana White hasn’t been shy about expressing his desire for the charismatic 35-year-old to shed his excess baggage. To Nelson’s credit, he has dropped a total of 17 pounds over his last four trips to the scales. Nelson weighed 263 for UFC 117, 260 for UFC 130, 252 (while sporting the above fat suit) for UFC 137 and notched 246 for UFC 143 in February. The veteran has packed on a few more pounds since his loss to Fabricio Werdum, but he’s ready for that number to head back down south. At the time of publication, Nelson had 66,002 likes on Facebook and 237,691 followers on Twitter.